The uniforms your cadets will wear during their Sea Cadet or League Cadet careers are a necessary part of their membership. The initial uniform charges will be no more than you would spend for Brownie, Girl or Boy Scout, Baseball or other uniforms for participation in other activities. A full initial compliment of uniforms costs over $100. The good news is that, as your cadet grows, you may not have to purchase the same items again in larger sizes. If the smaller sized item is returned to the unit in re-usable condition, the larger size of the same item will be provided at no additional cost. The following Uniforms are the prescribed uniforms for Escondido Battalion and Training Ship Kit Carson. Each uniform features a list of items required for each prescribed uniform. The lists are separated into groups between Sea Cadets and League Cadets, male and female, and uniform type. **The uniforms will be issued once enrollment is processed at NHQ. It is the responsibility of each cadet to request from the Supply Officer any items that are missing from their uniforms. However, should there be occasion that a cadet's size or uniform component is not available in Supply, the items will need to be purchased by the cadet's family. See below for suggested local and online uniform resources. NSCC Uniform Regulations. The following information is taken directly from this manual. Note: May be prescribed for summer wear when Formal Dress, Dinner Dress, or Full Dress Uniforms are not prescribed and civilian equivalent is coat and tie. Full Dress White when worn with large medals. Dinner Dress White when worn with miniature medals. White gloves will be worn with Full/Dinner Dress, or for ceremonial reasons. Occasion for Wear 1)	May be prescribed for wear year-round to all official functions when civilian equivalent dress is coat and tie. 2)	Full Dress Blue when worn with large medals. 3)	Dinner Dress Blue when worn with miniature medals. Notes 1)	Black gloves will only be worn with outer garments/foul weather clothing. 2)	White gloves will be worn with Full/Dinner Dress, or for ceremonial reasons. authorized for ceremonies and meetings where the Service Dress Blue Coat is more appropriate. 2)	Black gloves will only be worn with outer garments/foul weather clothing. 3)	White gloves will be worn with Full/Dinner Dress, or for ceremonial reasons. Note: The Navy Working Uniform (NWU) is intended for year-round wear as the standard working uniform. ashore when prescribed as uniform of the day. watchstanding, liberty or business ashore when prescribed as uniform of the day. Occasion for Wear. Worn in winter for office work, watchstanding, liberty, or business ashore when prescribed as uniform of the day. Note: The wearing of the necktab may be prescribed to present a more dress appearance. Note: The NWU is intended for year-round wear as the standard working uniform. All cadets will also need a set of Physical Training (PT) gear. This gear is to be purchased by the cadet parent or guardian. If desired, branded Sea Cadet PT gear can be purchased through the Supply Officer, otherwise these items can be purchased at any department store. You will be provided all required uniform flash, however, you will need to order your own set of name tapes (see below for places to order name tapes). Placement of name tapes and flash can be seen below. It is the parent's responsibility to have these tapes and flash sewn on correctly. The name tape should be sewn above and flush with the top of the wearer’s right pocket. The “USNSCC” or "USNLCC" tape should be sewn above and flush with the top of the wearer’s left shirt pocket. A U.S. 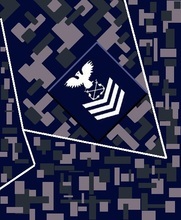 Naval Sea Cadets flash must be sewn on the right breast pocket with the eagle facing right. The Navy's logo is embroided on the left breast pocket and this logo must be visible at all times to meet USNSCC uniform regulations. The NSCC Rating Badges and Chevrons - Make sure that the EAGLES ARE FACING FORWARD on the sleeve! NSCC Collar insignia replicate NSCC rating badges for wear on the Navy Working Uniform in lieu of sleeve insignia. All Chief Petty Officers and Petty Officers wear miniature-sized embroidered grade insignia tapes on Navy Working Uniforms. ​NSCC Cadets in grades E-1 to E-3 and NLCC Cadets in grades LC-1 to LC-3 do not wear collar insignia. Uniform components of all personnel shall have ownership markings. Markings shall consist of owner’s surname and last four digits of owner’s social security number placed inside the garment, unless directed otherwise. Letters shall be approximately 3/8 inch high blocked letters. Markings shall be black on white uniforms, and white on blue/black uniforms.